How to Tell If Someone on Twitter Has Blocked You? The blog post has the answer to this question. It is super easy to block someone on Twitter, you just have to make few clicks and you’re done. You don’t have to give any explanation or a reason to someone. Guess what? The person you have blocked will never get any notification about it. The company keeps this thing private. While on the other hand, if you have a doubt that someone has blocked you, then finding this thing, is a bit complicated but not impossible. First, Search the username by typing it in the Twitter Search field available on the upper right corner. In case, the user profile is public, then it will definitely appear in the search result. If it won’t appear, then chances are that the user has blocked you. Second, if you’re not sure about the user username, then you can also search the users by his/her full name. Twitter will show you a list of all the user with the same name. Simply find the one you’re looking for. 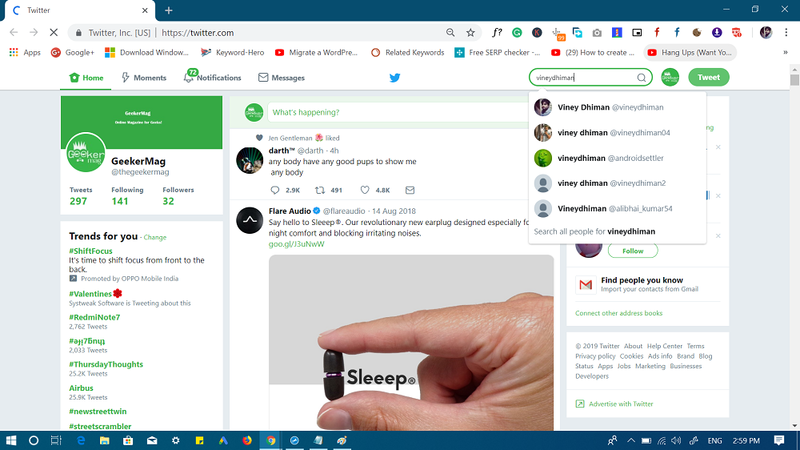 Third, Apart from this, you can also search the user using a recent tweet made by the user. If you’re unable to find the Twitter profile of particular by doing the steps discussed above, then chances are high that you’re blocked. If you’re very much sure about username of that particular user, then a quick copy-pasting workaround will help you out in find answer to question i.e. 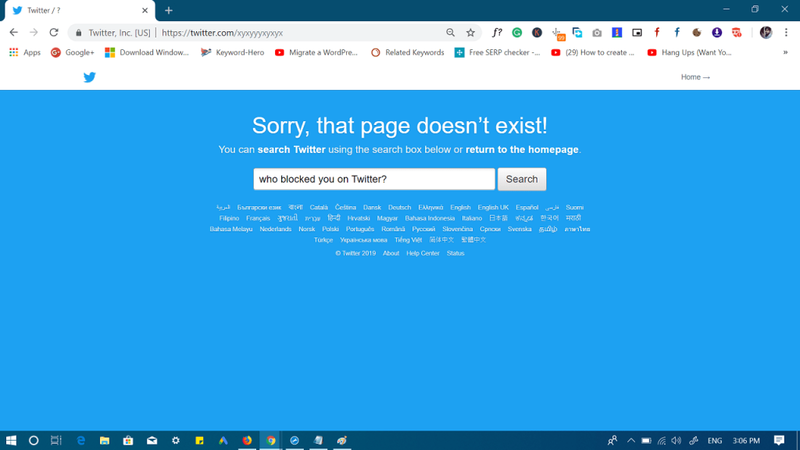 Who blocked me on Twitter. 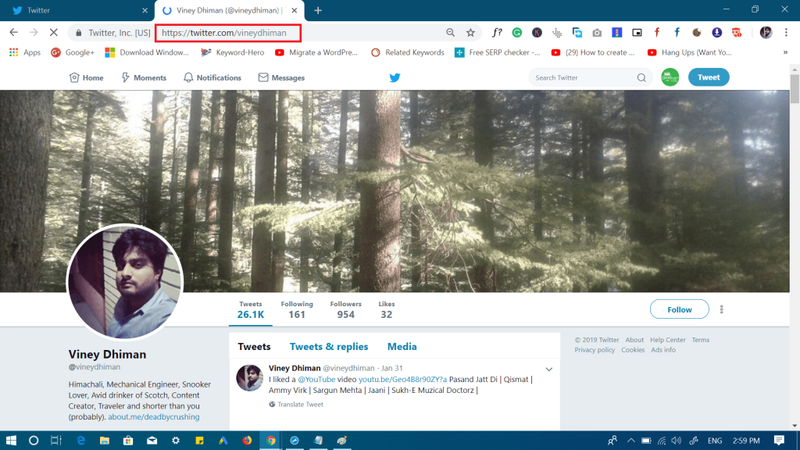 If user username is “vineydhiman” then full URL going to be https://twitter.com/vineydhiman. You can also check “Mutual friend” friend list, if you find the suspected user you think has blocked you in the friend list of common friend, then it confirms that you’re blocked for sure. 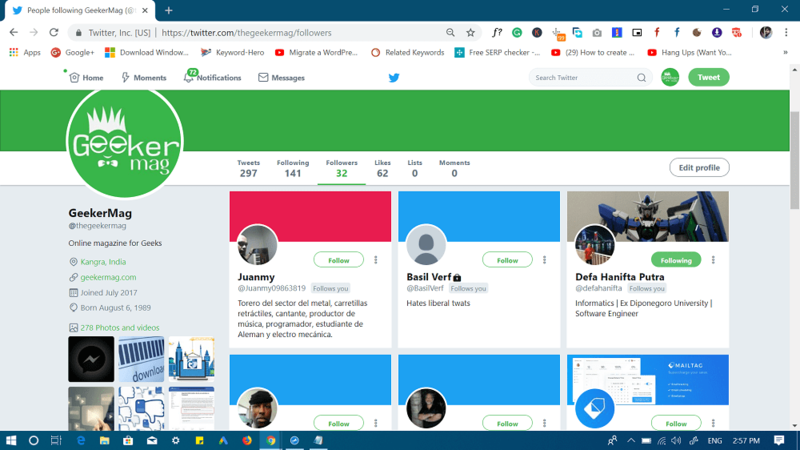 To check mutual friend, friend list on Twitter, either click on the Followers or Following option, you will find both options on the user profile page. From the list of Followers or Following start searching for the name of the friend. This method is time consuming, but believe me, using this method you will also able to find profile that are private. 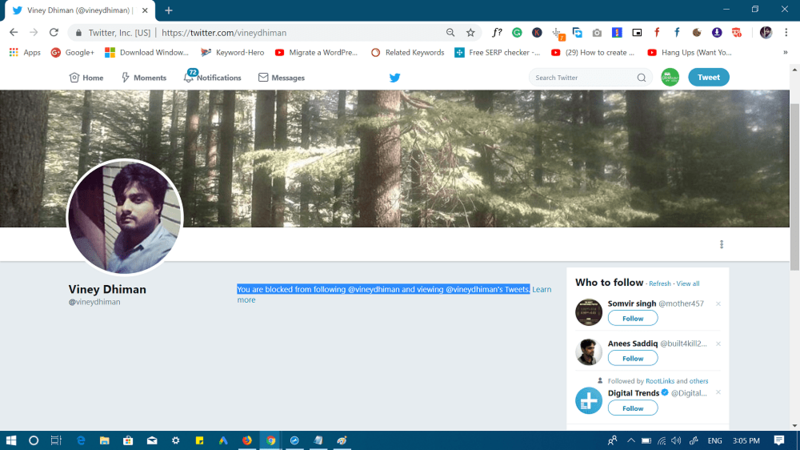 In case, you manage to find the profile of the user you doubt have blocked you, then try to check profile or the Profile summary. In case, you find Follow button in the Profile and you’re sure that you never unfollowed that person, then its confirms that you’re blocked by the user. If you still have a doubt, try to press the follow button, Twitter will instantly show you a message that you’re blocked by the user and you can’t follow the profile. If you are trying to send a message with an apology for your rude behavior or anything that make the particular user block you on Twitter, then you’re wasting your time. Why? It because your messages will never reach the inbox of the user who have blocked you. Find this blog post useful? Whatever comes in the mind, feel free to share in the comments.